Inflatable kayaks are preferred over other kayaks because they are light.They are easy to transport and use. The rigid kayaks can be a bit on the expensive side and beyond the reach of many people. Also, the inflatable kayaks are well designed, and the angler does not have to worry about punctures. They are just as tough as any other kayaks made from hard plastic or wood. Notice that they can easily be bought online. However, the challenge is finding the most suitable kayak that will serve your needs and purpose. This review looks at the best 10 Kayaks on the market. It is one of the top classic kayaks with a proven record. It is the best and the most popular entry-level kayak on the market. The kayak guarantees beginners and seasoned kayakers instant fun. It comes with excellent features and is lightweight. Carrying it from the car to the water is easy. The kayak is also strong and can carry a load of up to 220 pounds. This implies that it is suitably designed for children even though hefty adults can use it. The vessel is MMMA certified and adheres to ABYC standards. This kayak comes with eye-catching graphics that make it easier for an emergency responder to locate and find it in the case of emergency. It is made of a heavy, tough vinyl and can suitably be deployed in debris-laden rivers. The vessel can be used in rocky bottoms as well, but it may not withstand pointy logs or a sharp stick. This means that it is susceptible to punctures if care is not taken. 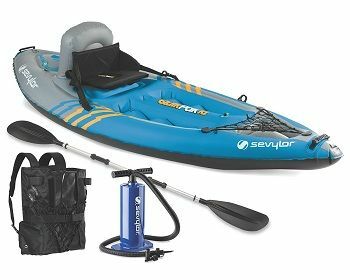 One of the reasons why this kayak is popular is that it only takes 3 minutes to inflate it using the Boston valve. Also, it comes with a good inflatable foot cushion and seat which must also be inflated as well. Strapping the seat into place will take you about 15 minutes. The kayak is comfy and has plenty of space for your legs. Also, it comes with an adjustable seat that allows you to sit back and relax. The kayak features some space in front which can be used to carry any cargo as long as it is secured with a net. Notice that this kayak has a low-profile design and comes with a skeg which can be used to control the vessel or help in maneuverability. Lastly, it comes with grab lines which are essential when you want to move it to the shore. Intex is lightweight and can keep 220 lbs buoyant at any instance. It is portable and can be collapsed down to fit in the trunk of your car. It makes it an ideal vessel for people who want to go kayaking far away. The kayak is stable and can be used even by inexperienced people. Comes with a cargo net where you can lock down your stuff. It is meant for recreational purposes and cannot be used for fishing. Anyone who owns a smartphone will be forced to leave it behind. Otherwise, it could become wet. The skeg must be secured with waterproof tape otherwise it can easily fall off. There are different types of kayaks out there with each one of them bringing something different and unique on the table to suit the needs and activities of different people. The Sevylor Quikpak K1 is not an exemption. Perhaps this vehicle was designed after realizing that carrying rigid kayak could be problematic especially if you are alone. Such kayaks are too heavy and unwieldy. On the contrary, the inflatable kayaks are lighter and can be carried by one person. The Sevylor Quikpak K1 takes 15 minutes to inflate and could be set up in just 5 minutes. The vessel was designed with some backpack which makes it easier for one to hike it to the water. Also, the unit comes with straps at the sides for easier paddling. The back pack can be of great use if you have a convertible that cannot fit in a kayak. 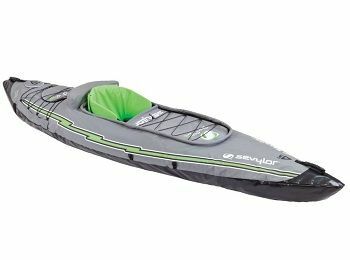 The Sevylor kayak uses a 21 gauge PVC which makes it suitable for people planning to visit gentle lakes. Its bottom is made of tarpaulin, which is durable and suitable for various occasions. The unit is easy to inflate and can be used by senior citizens. It uses multiple air chambers, and so when one of the chambers is punctured, it does not endanger your life since it cannot make it sink. The unit is stable, and the rider does not feel like he is going to tip over. Also, the rider can use the skeg to change the direction since it is quite responsive to changes. 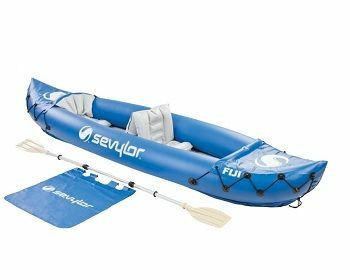 The Sevylor kayak is not meant for fishing, neither can it be used for choppy rivers. It can be an ideal vehicle if you live by a lake and you are a sightseeing enthusiast who loves relaxing rides. Comes with a seat that doubles as a backpack and has a supportive back rest. It is spacious and is efficiently designed to allow for stretching of legs. It is rugged and lined with a tough PVC with a bottom that is reinforced to reduce punctures and tears. It features a backpack design that allows hikers who do not have cars to go kayaking without a problem. One can get wet because of the water that comes from the paddle. The world of kayaking is moving fast due to new manufacturing techniques and the ever changing technology. 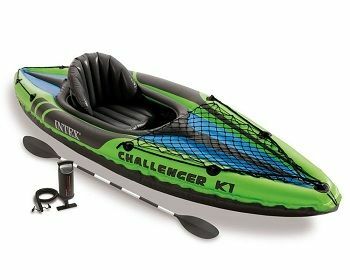 It makes the new Intex- Challenger to rank high among the many kayaks that come with features that anglers look for. 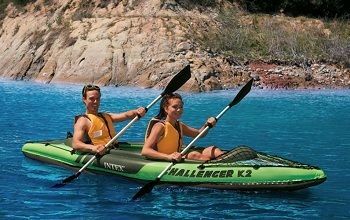 Intex Challenger K2is an excellent 2-person kayak by Intex. The vehicle is an ideal kayak for anyone planning to kayak on the gentle water. It was designed for beginners, and the paddler is free to bring a long a kid and still enjoy the ride. The vessel is longer than the K1 since it was designed for two people. It has a capacity of up to 400 pounds. It is made of the tougher heavy duty vinyl and is resistant to punctures. The unit can be used for fishing trips, or you could ride over rocks, and still, you will not end up with punctures. The vehicle can be patched easily, so you don't have to worry about punctures. Intex Challenger K2 features a storage space at the front which is secured by a mesh and is an ideal place to store fish. If you are alone, the 2nd seat can be removed to create more storage space. One can use the Boston valve to inflate meaning that it takes a few minutes to inflate it and enjoy your ride. Ideally, it will take about 20 minutes to set the unit. Note that the vehicle looks great and has an eye-catching design that enhances its safety. The design makes it easier for anyone looking for an emergency service because it makes the paddler more visible and reduces instances of being hit by other crafts. The unit features a vinyl that is UV-resistant which makes the design not to fade. Also, it suffers least from wear and tear because of overexposure to sunlight. Also, the unit is easy to control, and one can easily change its direction using the removable skeg. Notice that one can easily haul it to the shore and grab the lines on each end. It is 11.5 ft. long with a capacity of 2 passengers and can handle 400 lbs. It comes with a bright vinyl coating and eye catching graphics that makes it visible to reduce the risk of colliding. 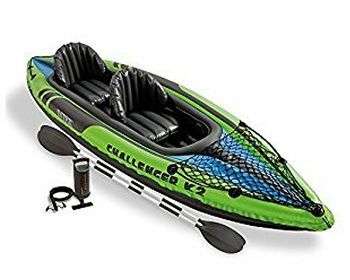 This is a great vehicle for beginners who would rather use a kayak to travel on calm lake water since it is simple to use. The unit is very maneuverable and allows one to control and determine where he wants to go. 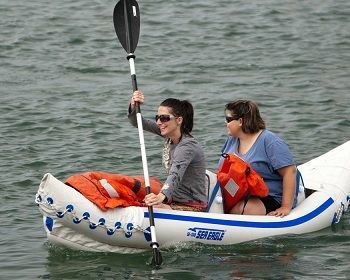 It is a 2-person kayak with some extra weight which keeps it down even when the wind is very strong. The unit's weight capacity allows it to handle two adults. The unit is extremely portable, and you can carry it to the water even when you are alone. Also, you can bring it along in the trunk of the car, and it can easily be kept it in the closet. It has tough materials, but you should avoid bottoming it regularly. It has a removable second seat which affords you more space where you can store your stuff. It requires at least 20 minutes to prepare the kayak. This is too much time. It was not designed for white water conditions and can only be used in gentle lakes. It does not come with special features you may need when you go for a fishing trip. People who sell this kayak are aware that great kayaks may have defects, so they check and ensure that the advanced element kayak delivered to buyers meets all the standards. Before it is delivered, it is inflated, pressure tested and locked up for 48 hours before it is packaged and shipped. It is an awesome one person vehicle that is a great asset for the beginners. The vessel is mostly bought by people who own a rigid kayak but who are looking for an inflatable kayak that can be used as a backup. However, one needs to get an appropriate paddle that is about 220 cm long to enjoy paddling. 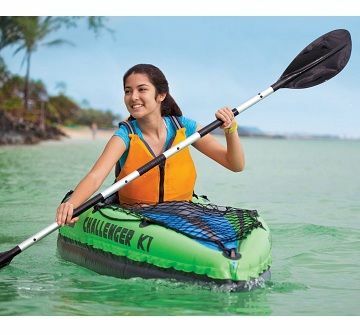 The inflatable kayak comes with seven air chambers, so there is no point to worry when you get a puncture. Also, inflating the chambers does not take long. Inflating the2 main chamber should take about 10 minutes while the rest will take about 5 minutes to fill. As soon one has inflated the chambers, you will have a rigid,firm and sturdy kayak which will not look like an inflatable. The kayak uses three layers of materials that make it difficult to puncture the vehicle. This is a first kayak that is wide in design. The design helps to stabilize it. It comes with built in aluminum ribs which are meant to help boost the kayak's tracking. This makes it easier to slice through water even though it is slower than narrower kayaks with a hard shell. Even though, it is not overly slow. The kayak has several air chambers that reduce the storage space available. However, there is more space in front which requires some mesh netting to secure it. The kayak can easily be deflated, packed and transported. Deflating it can take about 10 minutes, and this makes it easier for you to carry it in your bag. Also, it is easy to transport it in your vehicle or store it at home. The kayak is easy to pack up and set up. It is quite portable and can be stored without a problem. It is moderately fast and is easy to control. It is quite stable, so you don't need to worry about tipping over. It can easily be paddled as long as you have the right length of a paddle. If the paddle is too short, your knuckles will rub against the kayak. The storage space is inadequate. It doesn't come with nice fishing features, and so it is ideal for recreational purpose only. People who are 6 ft. tall may need to consider the bigger expedition version only. The vehicle is specially designed and looks like the running shoes. It is a convenient vehicle that is not just tough but agile and ready to go. The unit is lightweight and portable and comes with a backpack design, which makes it easy to transported or store it. The vehicle comes with side chords that allow you to bring along a paddle. When unpacked, the unit inflates easily and avails enough space for six footers. It weighs 250 pounds and is an ideal vehicle for adults. Essentially, this is an ideal kayak for beginners because it is easy to use. It comes with advanced features that make it suitable for experienced kayakers. The vessel is durable and makes use of 1000D x 1000D polyester at the bottom with a laminated two gauge PVC. The top of the kayak features 900D polyester and other materials that are resistant to punctures. The unit comes with an air leak-proof guarantee. It uses special valves which do not allow for any accidental air loss and incorporates an airtight system. The K5 is superior to other kayaks which are meant for beginners because it is a recreational kayak. The vehicle has adequate storage space and comes with a huge storage area, a bungee lacing, and D-rings.Also, it has built-in handles. It is comfy to ride and has a built in footrest. The unit comes with tracking fins that make it easier to control it. 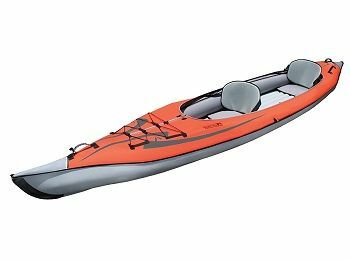 Also, it has a sleek design and is an ideal vehicle if you are looking for a perfect kayak to use when you go to your favorite lake. It is a good kayak for both novices and experienced anglers. In fact, it can be tried out on class 2whitewater. It can be folded into its backpack. It measures 10' x2'10'' and weighs 23 lbs. It comes with double lock™ valves. It comes with an aluminum paddle and a hand pump. It has a tracking fin and directional strake. It comes with other nice features such as multiple D-rings bungee lacing, footrests, and seats that can be converted to a backpack. It is lightweight hence it is very portable. Bringing it to the water is easier, but you can choose to use a motorcycle as well. It can easily be stored at home. Setting it up is easier, but it requires that you use an electric pump. Riding in this boat is fun, and it can comfortably be used by people who are 6 ft. tall. It can be controlled well and comes with tracking fins that work well and allows it to slice through water without a problem. It comes with enough storage space for all your equipment. It is a sturdy boat. It is one of the products from Coleman whose customer support is poor. It comes with many accessories which are responsible for the bad reviews. For instance, it comes with a paddle and a pump. It is one of the products from Sea Eagle that comes with cute looks. It is a good vehicle when in water, has plenty of amenities and performs great. The kayak is designed for two people, but it can easily fit three people. The unit weighs 650 pounds meaning that it is better than other kayaks, which are meant for two people but weighs 350 pounds. The Sea Eagle SE370 can accommodate two strong people. The kayak has a big capacity and allows you to bring along camping supplies that can last for several days. Sea Eagle SE370 is a tough kayak that uses 38 mm Polykrylar for the hull. It has a hard floor that is I-beam constructed and comes with a hull material that is resistant to saltwater and the sun. The vehicle has the seams welded together to come up with a solid piece. It is resistant to puncture and claw, and so it will not present any problem if a dog claws it. It is one of the units that can deal with ocean surf and whitewater without a problem. The unit comes with a self-bailing drain valve that helps a lot, but you must get free spray skirts. It comes with two fins that increase how the vehicle tracks while in water. For those who love camping, it is one of the units you should consider buying because it has a lot of storage space for all the supplies you need. Also, the second seat can provide more storage space if you need more. This makes it extremely versatile. Note that the vehicle is lightweight and you can carry it alone in a single bag. It does not take long to set up and inflate. According to Sea Eagle, it can take you about 8 minutes to set it up and inflate. If you are not in a hurry, you may take 15 minutes. The unit has a larger carrying capacity and weighs 32 lbs. This allows the anglers to take a long enough gear and food stuff. The hull is sun and saltwater resistant. It has two kegs at the bottom for speed and tracking. Setting and inflating the unit is quick. It is lightweight and portable. It can be carried by one person and storing it is much easier. It cannot be punctured by a dog's nails so if you have a dog; you are free to paddle it around lazily without risking puncturing it. It avails a lot of space for your stuff. It can carry two heavy people. This kayak should never be used for class 5 rapids. It is easy to maneuver and tracks fairly well. It does not move as fast as a rigid kayak even though this is a common problem to all kayaks. The unit is durable but is prone to leaks especially if it is pierced by thorns. This makes it unsuitable if you are planning to take it down the river. 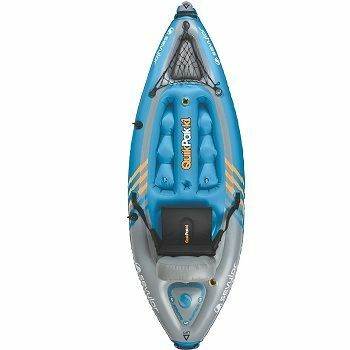 This is a good entry level boat that can be recommended to paddlers looking for a good but inexpensive kayak. It is a great vehicle for couples. It is a good two-person kayak that can handle 500 pounds of weight. 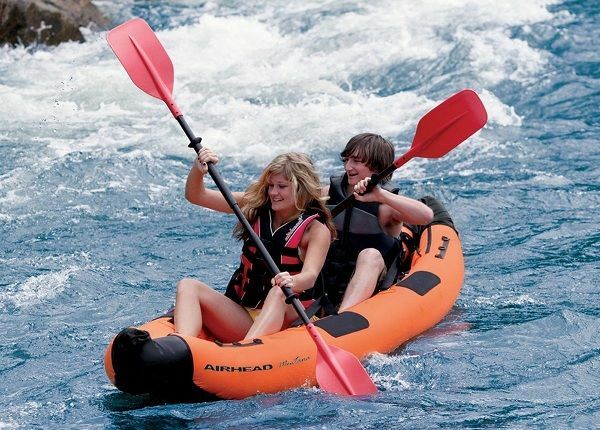 The kayak can be used on moderate white water or gentle lake. It makes use of 2 Boston valves that are used to deflate and inflate the kayak. When deflated, it fits well inside a duffel bag or the trunk of the car. It is light and can be carried to the water by a single person. 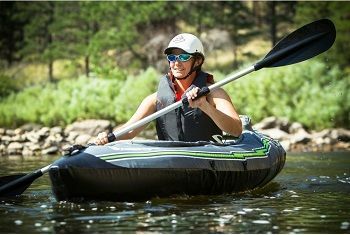 This kayak is tough when inflated and comes with three air chambers. It utilizes a strong 80 denier nylon which is UV and water resistant. The unit comes with a tubular l-beam floor with a strong and laminate reinforcement. Also, it comes with a stainless steel hardware and nylon which are all rustproof. Getting the vehicle into the water is easy thanks to the grab handle. Also, the vehicle performs better than other inflatables. It has a low drag, but its tracking is great thanks to the fins at the bottom of the unit. The aft and the fore have a spray cover that guarantees extra comfort. It comes with a neoprene elbow guards. It also features a net at the bow, which could be used to secure the supplies you may choose to carry. The unit features a lot of 6D-rings at the stern and the bow. It has sturdy D-rings that allows one to secure his gear. The seats are inflatable and convenient and feature support bracket. It comes with 500-pound weight allowance which allows it to carry two people. The vehicle tracks and moves well in the waters, and so it can suitably be used for moderate white waters. Deflating and inflating it does not take a lot of time and effort. Newbies will find it difficult to set and inflate the kayaks. The reason for this is that the instructions that come with this kayak are not helpful. 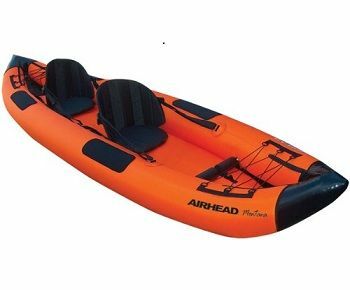 The AIRHEAD Montana performance kayak is responsive maneuverable and inflatable. It features three chambers that are easy to inflate. If you are planning to take your kids for kayaking adventures, the Sevylor Big Basin is one of the options you have. The kayak has three seats and can accommodate two children. It has a capacity of 90 pounds and is NMMA certified. You will not have to worry about puncturing the unit since it is made of a heavy-duty PVC and comes with a rugged bottom tarpaulin. The unit makes use of an airtight system which does not allow any air to leak. Also, it comes with multiple air chambers meaning that a single puncture will not require emergency attention and may not endanger your life. It is a great tool for those who would want to venture into white waters. It offers a good ride and comes with comfortable and adjustable seats. It also comes with a spray cover which ensures that you remain dry as you enjoy your day on the water. Has three air chambers and uses an Airtight® system that is leak proof. The kayak has a weight capacity of 490 lbs. The vehicle is leak-proof and cannot be punctured easily. The unit has a tracking fin and strakes which ensure that it tracks well. Removing the 3rd seat will give the second person a chance to paddle it without any problem. However, it is possible to have three people paddling the Kayak. It comes with comfortable seats with a back support and plenty of drink holders. It does not come with mesh netting, and so it’s hard to store some supplies. It is slow if you are paddling it alone. 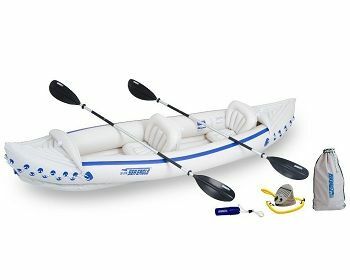 This kayak is compact and is ideal for anyone looking for a light kayak that children can carry and have fun on the water. The vehicle is extremely light and could be carried by any teenager. Even though, the kayak can also be used by adults since it has a capacity of 250 pounds and comes with advanced elements Firefly that makes it easy to inflate the vehicle with a Twist lock and spring valve. Also, it features a rubber molded handles which could be used to bring it in and out of the water. Notice that the vehicle is durable and tracks quite well on the water. It comes with a rigid panel which defines the bow and stern and greatly enhances tracking. Also, the unit comes with a fin and landing plates that help to keep it in the required direction. It does not have much space to store your stuff or push your legs. It is a two person kayak with a capacity of about 400 pounds and comes with a fixed rear seat. However, the seat in the middle could be removed to give the legs more room for stretching. The vehicle is durable since it is made of a 22 gauge PVC which ensures that punctures are minimized. Also, it comes with multiple chambers whose job is to ensure that the vehicle is kept a float if any of the chambers is punctured. About air leaks, the kayak utilizes an airtight system which makes it leak free. It comes with special valves whose job is to make deflation and inflation quick and fast. The kayak is lightweight and could be carried by anyone. It is a stable kayak with grab lines at the stern and the bow which further increases its stability and makes it a great kayak for leisure travel. However, if you choose to use this boat, you should use spray covers to ensure that you don’t get wet. Problems of air leaks and punctures are eliminated. This is a great tool for leisure kayaking. The boat is extremely stable. It is a portable vessel. The vehicle gets cramped when it is used to carry two people. It is only suitable for beginners or anyone who wants a relaxed water ride. How portable is the unit? All inflatable kayaks should be portable. In fact, this is why they are preferred compared to the rigid ones. However, some of the kayaks are more portable, are lightweight and can conveniently be taken to a water body. There are kayaks for individual users which can only allow one person to go on an adventure. These kayaks have plenty of room for equipment and legs. However, we also have those that can accommodate three people. They come with removable seats and could handle 1 to 2 people. The number of people the kayak can accommodate and the equipment they can carry is vital because it determines whether you buy a kayak or not. There is a 2-seater kayak, with a low weight limit which may only accommodate an adult and a child. The weight of the equipment you intend to carry is also a crucial factor one has to consider before buying a kayak. Kayaks with low weight limit may only carry an adult and a child. They may not be suitable for people planning to bring equipment or those going out for camping. How easy is it to inflate the kayak? A kayak should take a few minutes to inflate. However, there are those that take longer before they can be inflated and used. The quality of the kayak is an important factor. How tough a kayak is and the material used to make it are all important since they determine whether the kayak is susceptible to punctures or not. Was it designed for a specialized purpose? Kayaks can be used for different purposes. There are those that can be used for fishing, while others are designed to be used for whitewater adventures. Also, there are those that are just meant to be used for recreational purposes. We have entry-level kayaks that are designed and meant for beginners and those that can be used by pros. As such, it is important that you check out the features that support the purpose you want to deploy the kayak to. Some kayaks come with free air pumps and paddles while others do not. You need to check out if there are free offers. It is important that you check out the amount of space available and whether it can fit everything you have. Kayaks that come with well-padded seats and those that have an ample back support and adjustable seats are the best options. W​​​​​hat about the storage space? Check out and ensure that your fishing kayaks have enough hatches and spaces for the equipment you will be carrying. Does it have cup holders or storage space where you can keep your smartphone? To find answers to this question, it is important that you check out the views about the features and whether the kayak can change direction easily. Also, check if it can be paddled with ease. A kayak that is not stable is dangerous. It could tip over when you are out fishing and endanger your life. Fortunately, we have plenty of kayaks that are stable and which you can sit on the side or stand on without risking tipping over. Even when you choose to limit your search to inflatable kayaks, you have plenty of options to choose from. There are many inflatable kayaks have greatly been improved on and are now being used by pros. They mean a lot and could be of great value especially if you know how to pick one that is meant for a particular purpose. Ensure that you know your needs beforehand and choose a kayak that can serve your purpose.